January 5, 1987 – CWA: Badd Company (Pat Tanaka & Paul Diamond) defeated Tarzan Goto & Tojo Yamamoto. January 12, 1987 – CWA: Badd Company (Pat Tanaka & Paul Diamond) defeated Jonathan Boyd & Tony Burton. July 27, 1987 – CWA: The Badd Company (Pat Tanaka & Paul Diamond) defeated Alan West & Mark Starr. 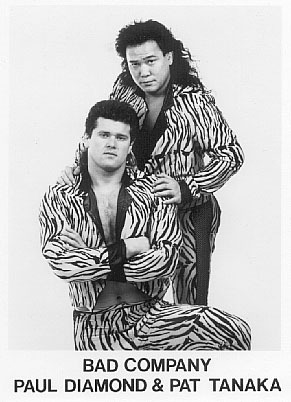 October 12, 1987 – CWA: The Badd Company (Pat Tanaka & Paul Diamond) defeated John Paul & Tracy Smothers. March 19, 1988 – AWA: Badd Company (Pat Tanaka & Paul Diamond) defeated The Midnight Rockers (Marty Jannetty & Shawn Michaels) to win the World tag team titles. April 4, 1988 – CWA: The Badd Company (Pat Tanaka & Paul Diamond) defeated The Mighty Yankees (Mighty Yankee #1 & Mighty Yankee #2) to retain the AWA World tag titles. April 15, 1988 – AWA: Badd Company (Pat Tanaka & Paul Diamond) defeated The Midnight Rockers (Marty Jannetty & Shawn Michaels) to retain the World tag team titles. May 9, 1988 – CWA: Badd Company (Pat Tanaka & Paul Diamond) defeated Billy Travis & Tom Brandi to retain the AWA World tag titles. May 14, 1988 – AWA: AWA World tag team champions Badd Company (Pat Tanaka & Paul Diamond) defeated Greg Robertson & Houdini in a non-title match. Badd Company (Pat Tanaka & Paul Diamond) defeated Hector Guerrero & Mando Guerrero to retain the World tag titles. May 23, 1988 – CWA: The Badd Company (Pat Tanaka & Paul Diamond) defeated Bob Holly & Pat Rose to retain the AWA World tag tiles. May 29, 1988 – CWA: The Badd Company (Pat Tanaka & Paul Diamond) defeated Don Bass & Gary Young to retain the AWA World tag titles. July 29, 1988 – AWA: The Badd Company (Pat Tanaka & Paul Diamond) defeated The Top Guns (John Paul & Ricky Rice) to retain the World tag titles. July 30, 1988 – FCW: Badd Company (Pat Tanaka & Paul Diamond) defeated Mike Graham & Steve Keirn to retain the AWA World tag titles. August 20, 1988 – AWA: Badd Company (Pat Tanaka & Paul Diamond) & Col. DeBeers vs. Chavo Guerrero, Hector Guerrero & Mando Guerrero ended in a no contest. September 17, 1988 – AWA TV Taping: The Badd Company (Pat Tanaka & Paul Diamond) defeated Ray Odyssey & Shawn Baxter to retain the World tag team titles. September 18, 1988 – AWA TV Taping: Jeff Jarrett, The Rock ‘n’ Roll Express (Ricky Morton & Robert Gibson) & The Top Guns (John Paul & Ricky Rice) defeated Cactus Jack, The Badd Company (Pat Tanaka & Paul Diamond) & The Rock ‘n’ Roll RPM’s (Mike Davis & Tommy Lane). September 18, 1988 – AWA TV Taping: The Badd Company (Pat Tanaka & Paul Diamond) defeated Natures Best (Bill Justin & Darryl Justin) to retain the World tag titles. September 19, 1988 – AWA TV Taping: The Badd Company (Pat Tanaka & Paul Diamond) defeated The Rock ‘n’ Roll RPM’s (Mike Davis & Tommy Lane) to retain the AWA World tag titles. October 15, 1988 – AWA: Chavo Guerrero & Mando Guerrero defeated The Badd Company (Pat Tanaka & Paul Diamond). November 24, 1988 – CSW: The Badd Company (Pat Tanaka & Paul Diamond) defeated Derrick Dukes & Rick McCord to retain the AWA World tag titles. December 2, 1988 – AWA: The Badd Company (Pat Tanaka & Paul Diamond) defeated Derrick Dukes & Michael Hayes to retain the World tag titles. December 13, 1988 – AWA: The Badd Company (Pat Tanaka & Paul Diamond) & Madusa Miceli defeated The Top Guns (Derrick Dukes & Ricky Rice) & Wendi Richter. December 16, 1988 – AWA: The Badd Company (Pat Tanaka & Paul Diamond) defeated Brad Rheingans & Derrick Dukes to retain the World tag titles. January 7, 1989 – AWA: The Badd Company (Pat Tanaka & Paul Diamond) defeated Chavo Guerrero & Mando Guerrero to retain the World tag titles. January 26, 1989 – AWA: The Badd Company (Pat Tanaka & Paul Diamond) defeated Eddie Guerrero & Mando Guerrero to retain the world tag titles. February 2, 1989 – AWA: The Badd Company (Pat Tanaka & Paul Diamond) defeated Hector Guerrero & Mando Guerrero to retain the World tag titles. February 18, 1989 – AWA: The Badd Company (Pat Tanaka & Paul Diamond) defeated Greg Gagne & Tom Zenk to retain the World tag titles. March 4, 1989 – AWA: The Badd Company (Pat Tanaka & Paul Diamond) defeated Ken Patera & Terry Gibbs to retain the World tag titles. March 25, 1989 – AWA TV Taping: The Olympians (Brad Rheingans & Ken Patera) defeated The Badd Company (Pat Tanaka & Paul Diamond) to win the world tag team titles. April 13, 1989 – AWA: Tommy Jammer & Wahoo McDaniel defeated The Badd Company (Pat Tanaka & Paul Diamond). April 22, 1989 – AWA: Greg Gagne & Wahoo McDaniel defeated The Badd Company (Pat Tanaka & Paul Diamond). May 6, 1989 – AWA TV Taping: Derrick Dukes & Tommy Jammer defeated The Badd Company (Pat Tanaka & Paul Diamond). May 6, 1989 – AWA TV Taping: Derrick Dukes & Tommy Jammer vs. The Badd Company (Pat Tanaka & Paul Diamond) ended in a time limit draw. May 20, 1989 – AWA: Ken Patera & Tommy Jammer defeated The Badd Company (Pat Tanaka & Paul Diamond). October 1, 1993 – NWA Bloodfest: The Badd Company (Pat Tanaka & Paul Diamond) defeated Bad Breed (Axl Rotten & Ian Rotten). Johnny Hot Body & Tony Stetson defeated The Badd Company (Pat Tanaka & Paul Diamond) to retain the ECW tag team titles. October 2, 1993 – NWA Bloodfest: The Badd Company (Pat Tanaka & Paul Diamond) defeated The Public Enemy (Johnny Grunge & Rocco Rock). The Public Enemy (Johnny Grunge & Rocco Rock) defeated Bad Breed (Axl Rotten & Ian Rotten) and The Badd Company (Pat Tanaka & Paul Diamond) in a 3-way tag team steel cage match. November 13, 1993 – ECW November To Remember: The Public Enemy (Johnny Grunge & Rocco Rock) defeated Badd Company (Pat Tanaka & Paul Diamond). February 28, 1994 – WWN TV Taping: The Public Enemy (Johnny Grunge & Rocco Rock) defeated Badd Company (Pat Tanaka & Paul Diamond). March 26, 1994 – ECW Ultimate Jeopardy: The Bruise Brothers (Don Harris & Ron Harris) defeated Badd Company (Pat Tanaka & Paul Diamond).